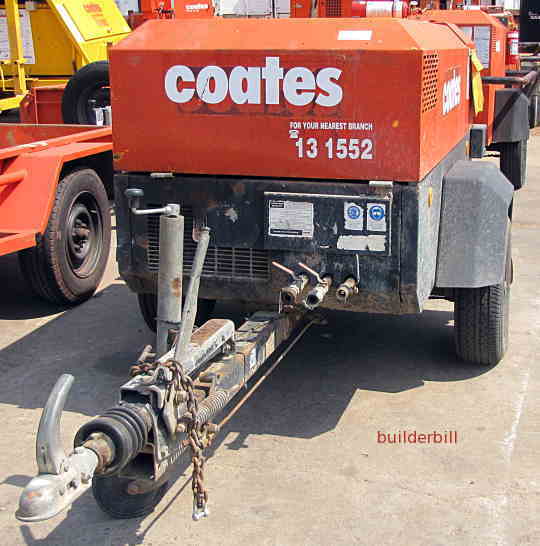 A tool run off compressed air used for breaking rocks and concrete. The typical work for a pavement breaker or jackhammer is done by holding the machine vertical and letting the weight of the machine bear down on the material to be broken. As a result they all have the "T" type of handle. They range from 30lbs weight to 90lbs. The one shown here is probably 75lbs. 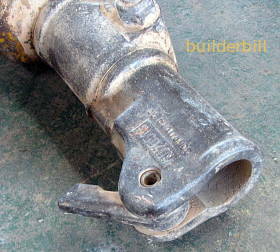 Smaller breakers for working horizontally in wall demolition have "D" handles and smaller ones still have pistol type grips. Work health regulations govern the use of these machines and the yellow plastic jacket is a silencer. 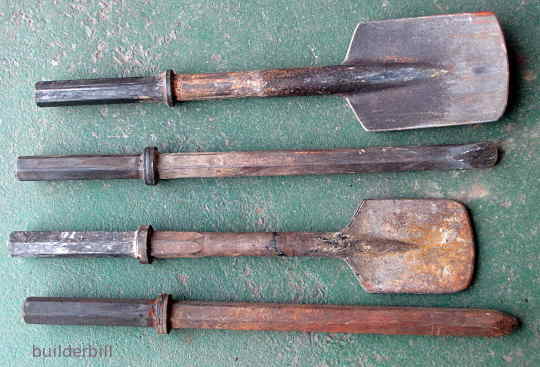 There is a range of tools available from the wide Clay Spades with a curve and Ashphalt Cutters that are straight to Chisel Points , narrow and wide, and Moil Points. There are also quite a few more specialised tools made that fit into these breakers. The convention of using imperial sizes seems to still continue and the 1-1/4 inch refers to the measurement across the flat of the hex. The tools are loaded into the jackhammer by turning the toggle at right angles to the machine. This places a cam on the toggle in the open position. When the toggle is swung around close to the body the cam locks the tools. These machine get very hot in use and the locking and unlocking is normally done with a hammer. 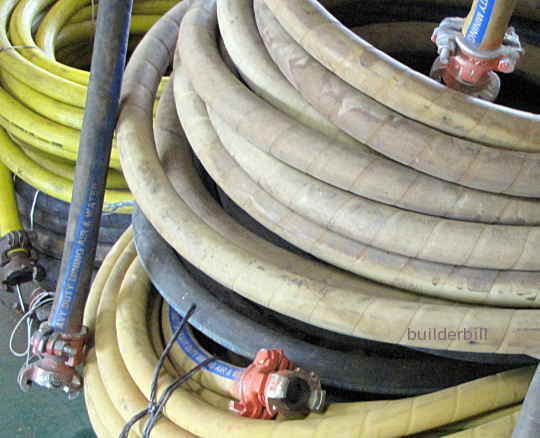 The air delivery hoses come in lengths from 30ft to 50ft and they are joined with claw couplers. The couplers have holes in them so that spring clips can be used to secure them. It is advisable to use the retaining clips, because if the couple comes undone while under pressure then the loose end of the air hose will lash around in an uncontrolled manner. Never try to catch a flailing hose, but go to the compressor and close the air valve. A jackhammer like the one above needs around 75cfm (cubic feet of a minute) to operate efficiently. Small compressors that will only handle one jackhammer at a time are now few and far between and the one shown here puts out about 165cfm and can easily handle a few air tools at the one time.